Searching for a mattress in Hawaii usually means shopping for a mattress in Hawaii. Unlike other states, you’re not likely to cross state borders to find a great deal. However, there are still some great mattress options out on your island paradise. When in Hawaii, it’s essential to live and breathe the spirit of aloha. Without a good night’s sleep it’s difficult to take on any day, no matter what the scenery is or what the weather is like. If you want to live and breathe aloha, then you need restorative sleep. Which is where we can help. 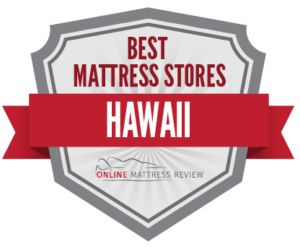 We combed through the top-ranked mattress shops on all of the major islands of Hawaii and pulled out locations that offered a wide range of mattresses, and great customer service. What we found were a number of places that provided no-pressure sales as well as affordable prices. Are you looking to purchase a mattress in Kauai? You have a few options. BedMart Mattress Superstores (4454 Nuhou St. Lihue, HI) is a great place to head for quality name brand mattresses and fantastic customer service. The company offers a wide variety of styles for all type of sleeper and all types of budgets. If you are looking for a hassle-free sale, this is the spot. Aloha Furniture Gallery (2981 Umi St.) is where to go for premium mattresses and more. If you’re interested in a one-stop shop, this is a great place. The furniture is stylish and tasteful, an Aloha Furniture offers premium Serta mattresses. Mattress Firm Kauai (4303 Nawiliwili Rd. Space J1B Lihue, HI) offers over 55 brands of mattresses and a 120 night sleep happy guarantee. As with all Mattress Firm locations delivery is conveniently scheduled for same-day or next-day delivery. Have you ever wondered: Where can I find a quality mattress in Maui? You’re not alone. While there are a number of options in Maui, it’s difficult to discern which one is the right fit. We are here to help. We looked for locations that had a great selection of mattresses, great customer service, and a range of prices to meet all budgets. Here’s what we found: BedMart Mattress Superstores (444 Hana Hwy Kahului, HI). This is one of the most consistently run businesses across locations no matter what island you’re on. The show room is clean and the staff are super knowledgeable. We like that the company offers a wide selection including firm, memory foam, adjustable, and more. The prices are affordable, and shipping is convenient. Really, what more can you ask for? Lifestyle Maui (703 Lower Main St.) says it all in the name. This furniture and mattress store offers quality products for affordable prices. What’s more, is that this company seems to staff the nicest and most accommodating people. The sales team don’t pressure you to purchase outside of your budget and the crew are phenomenal from the moment you order to delivery. Getting a great night’s sleep is a breeze with Lifestyle Maui. SlumberWorld (374 Hanakai St. Kahului, HI) has a great selection of mattresses. What’s more the staff are easy-going, patient, and NOT PUSHY. If you’re shopping for a mattress in Hilo, first head into BedMart Mattress Superstores (2100 Kanoelehua Ave.) where you’ll find a bright team of sleep experts ready to pair you with a mattress that fits your need and your wallet. The team works really hard to ensure that you find something that will help you get restorative sleep. So, if you are tossing and turning at night, head into BedMart Mattress Superstores. Another option in Hilo is Mattress Firm Hilo (708 Kanoelehua Blvd.). Like with all Mattress Firms, you’ll find over 50 mattresses to choose from including many of the name brands you’ll be familiar with. The sales team are really what makes this location shine as the team are friendly, and relaxed- meaning you won’t feel pressured to make a purchase before you’re ready. There’s another great location in Kailua-Kona (73-5560 Maiau St.). Dragon Mama Futon Shop is located in Hilo (266 Kamehameha Ave.) where you’ll find custom-made futons and kabutons. The company use unique Japanese fabrics, and makes shopping for a bed a lot of fun. If you need something unique for your special space, definitely head into Dragon Mama. That wraps up our guide to the best mattress shops in Hawaii. We hope you find what you’re looking for!